I think I may have mentioned Not the End of the World by Geraldine McCaughrean recently. If not, let's just say that it totally changed my perception of the Noah's Ark story, which I pretty much only knew about from teaching preschool Sunday school. To this day, I don't think I've read the Bible passages that refer to it. 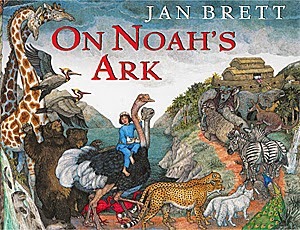 Yesterday I did a little Noah reading with a young family member.We began with On Noah's Ark by Jan Brett. Beautiful book. It began with "Grandpa Noah says that the rains are coming. Soon the land will be covered with water. Grandpa Noah is building an ark for our family and the animals to live on until it stops raining." Our family is chilling to me now. Because we're talking only our family. The last page includes a lovely rainbow, though it doesn't mention anything about the rainbow in the text. I know that the rainbow is supposed to represent God's promise to never destroy the world with water again. (According to preschool stories, at least.) That's comforting, I suppose. But doesn't it leave you to wonder, How will you destroy it? 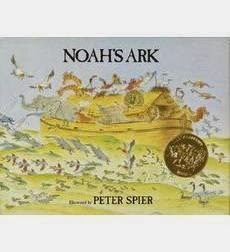 We went on to Peter Spier's Noah's Ark. Another beautiful book, a Caldecott winner. This is a wordless volume. Nonetheless, when I got to the page with the elephants left in the rain watching the ark that they've been shut out of...eek. And then the page with the four columns showing the ark floating above a building and a whole village? Okay, there were no bodies. But, also, there was nobody. Thank goodness my Sunday school teaching days are behind me.